“Sink, Sink, Sink!!! !,” that was the sadistic mantra of the crowd during our 2003 attempt at the Nail and Sail competition. 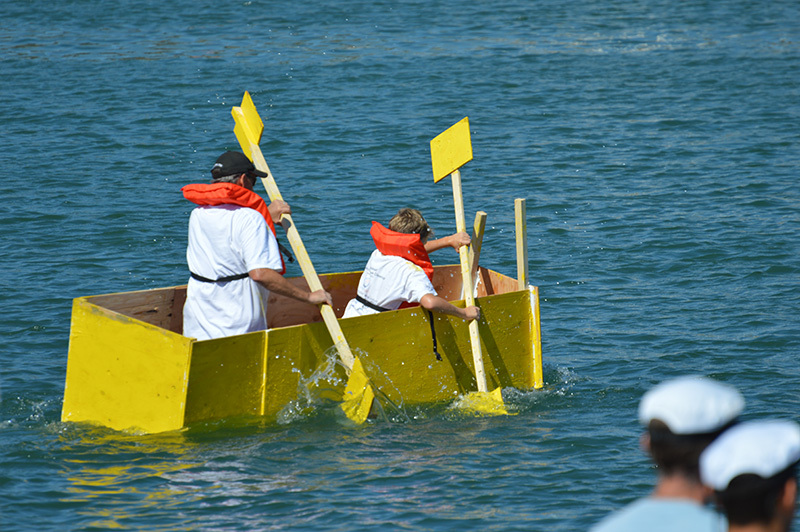 With no idea on how to build a boat, we still entered the event with a basic design of a square boat and an angled front. We utilized all of the wood provided and basically made a heavy, oversized box. 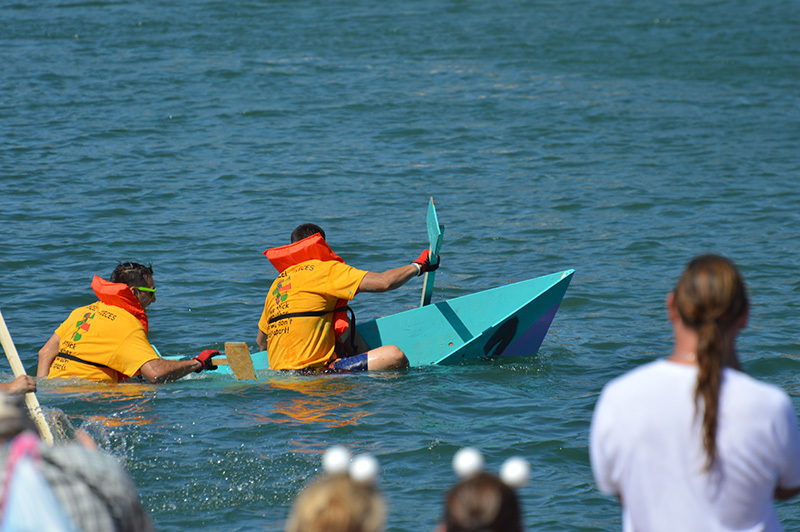 As the monstrosity was taking on water during our heat, my two tired team mates were heroically paddling the massive wooden boat back to home base. 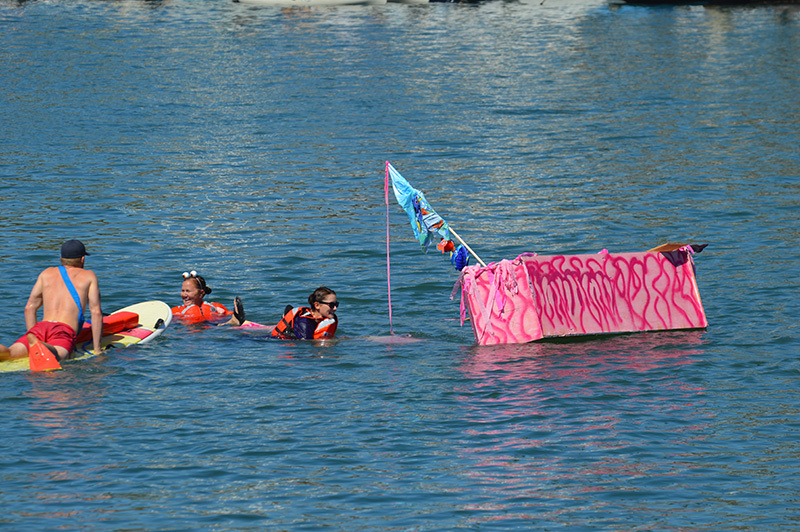 Being the last boat in the water, the crowd was hungry to see yet another boat tip over or just plain…sink. They were merciless in their continual chant. We are happy to say we did not oblige them the pleasure and our team made it back in one piece with about 6 inches of water seeping through the seams. So what possessed us to try this again? Staycationer Jojo of course. She makes it her life mission to find things unusual and fun to do. Sometimes fun is a subjective word, but in all of our adventures we can at least say we tried it, whether we liked it or not. 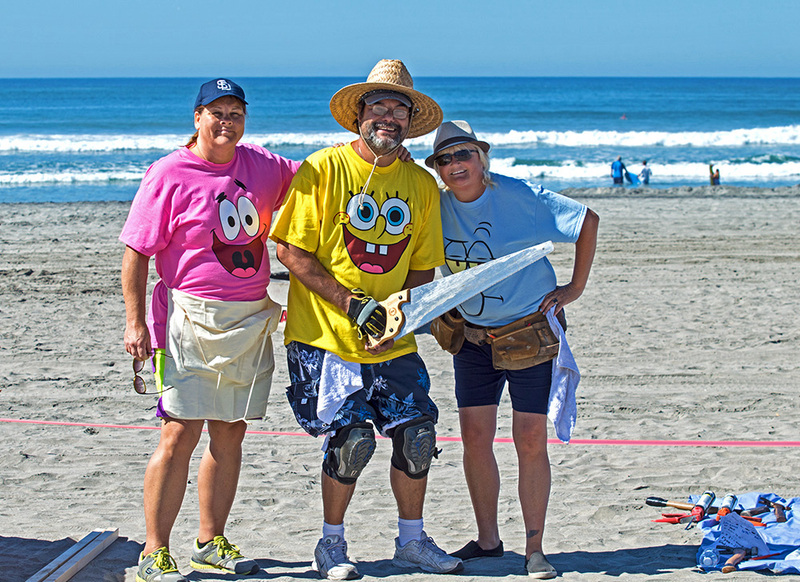 Thirteen years later two of the original three, myself included, decided that it wasn’t still on our bucket list, so JoJo found a new crew and competed on September 25th, 2016. 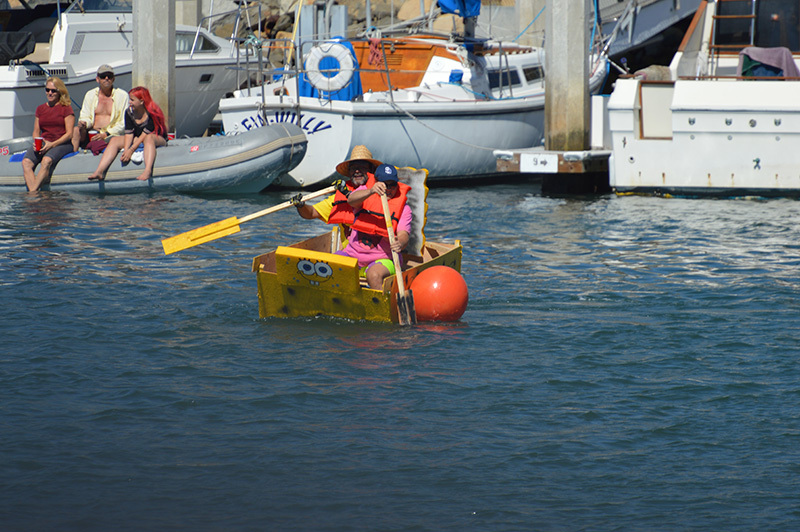 This time she recruited a former sailor and although the design was still square, it was a little more streamlined and sea worthy because of his ideas. 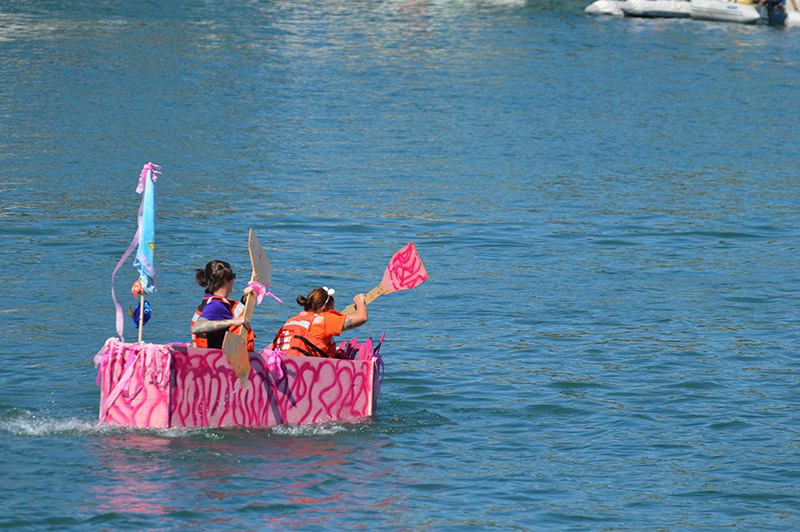 They had two hours to construct the boat and a half hour to decorate. 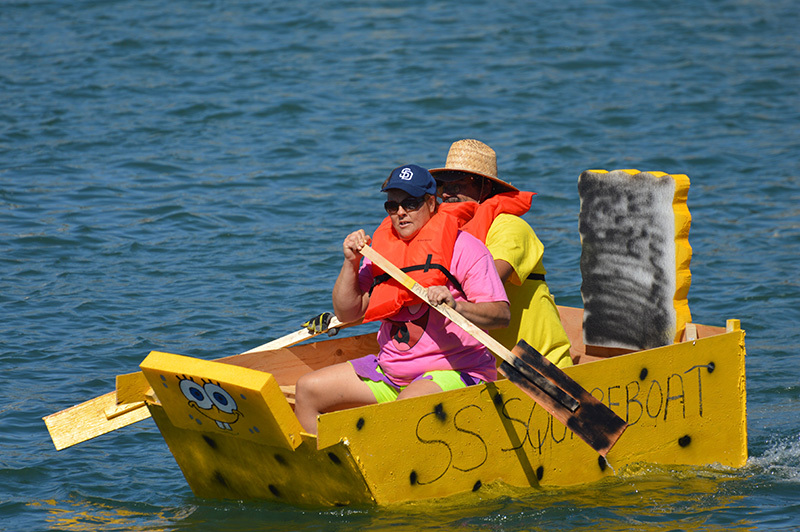 Our original team name was “Shark Bait” but this time they called themselves “Sponge Bob Square Boat” in honor of the soon to be square boat. 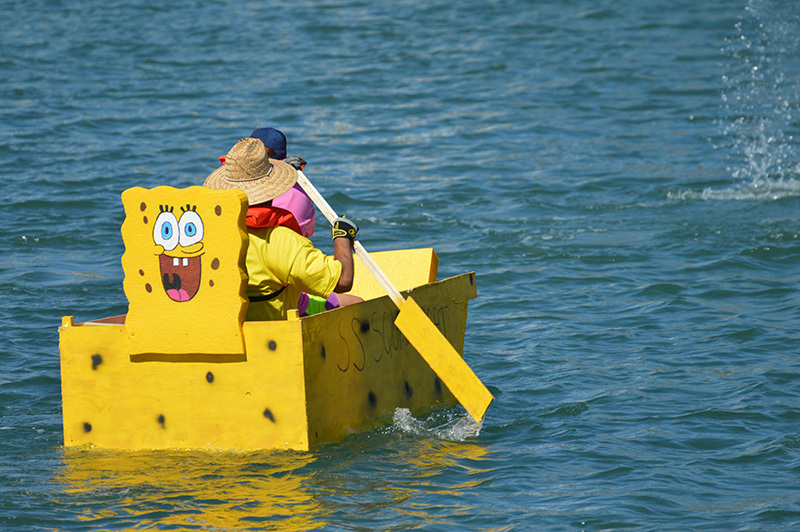 They wore Sponge Bob shirts and painted the boat yellow to keep in the spirit. 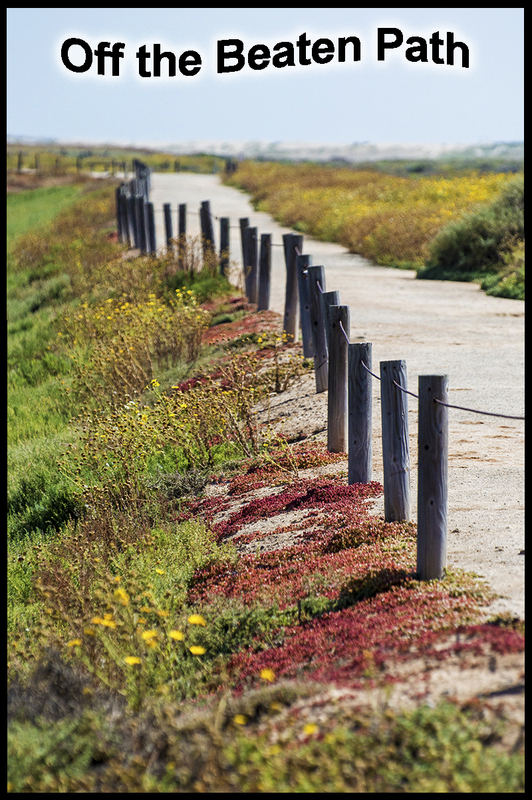 The two hours of building was made exceptionally hard because of the extremely hot weather we were experiencing here in Southern California just a few days into autumn. After an hour they had all but the front of the boat built. 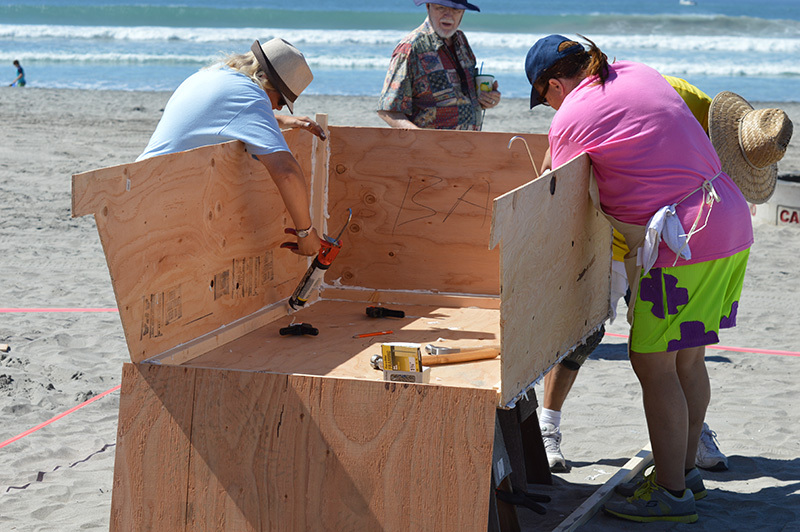 The event gives you a couple pieces of plywood, some other various wood, caulking, and nails. That is it!! No power tools are allowed so you are down to hammers, saws, and whatever else you can find around your house to help construct it in that limited time. 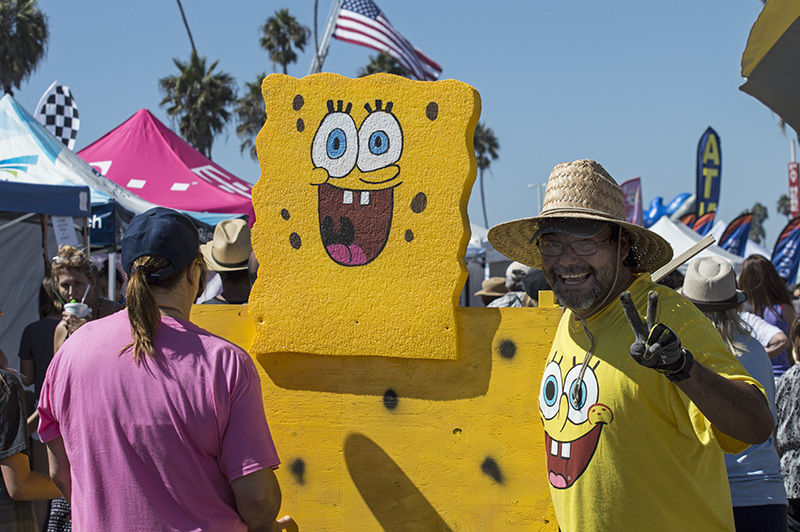 The grueling heat didn’t deter the Sponge Bob crew as they finished on time. Another half an hour was given to decorate and then it was time to take the boats to the dock for launching; now was the real test to find out who was seaworthy. 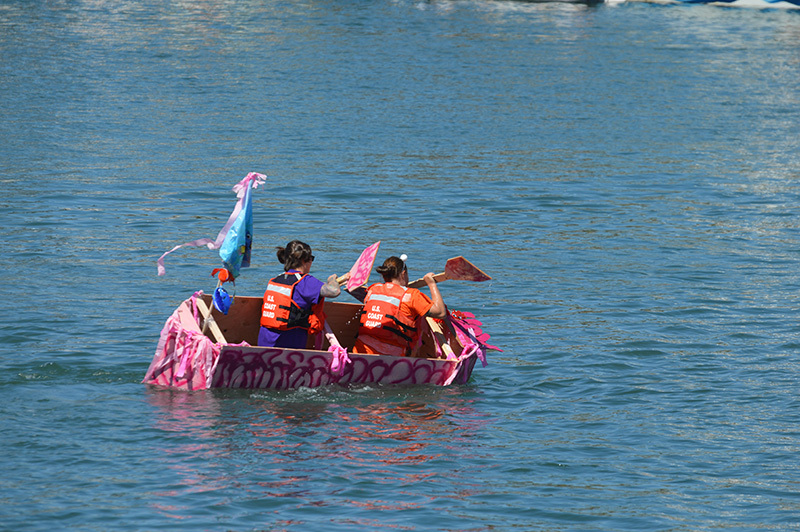 A few of the boats had return participants and it was evident because of how fast they moved in the water and the sturdiness of their craft. They had clearly done this before. A few others, it was equally clear that this was their first time as a few didn’t make it too far before sinking or tipping over. 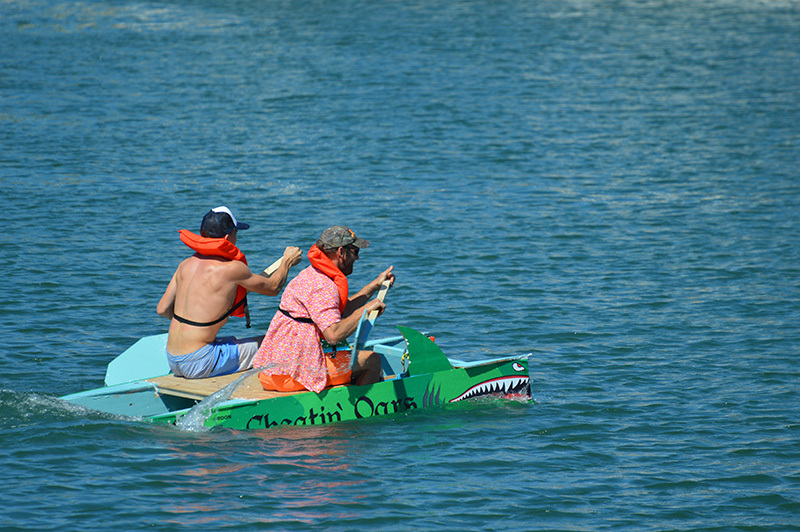 However, all participants gave a gallant effort and of course the crowd favorites are the ones who sink or tip over. The Pink Team, going, going, gone. A catamaran with a sharks head. Always a crowd favorite, the tipping over or sinking boat. 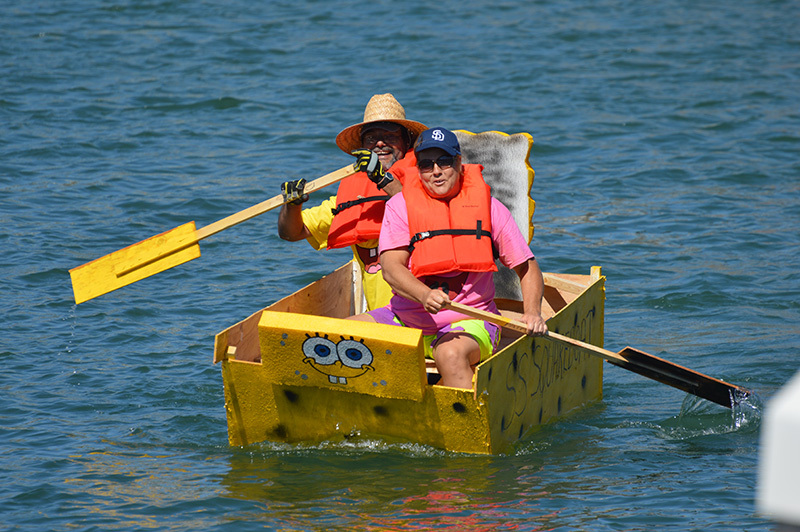 The third heat, Sponge Bob Square Boat was hoisted into the water. After a slow start, they were on their way. Sorry to say, they’re not going to win any speed records but they made it back to the starting dock in one piece and dry. That in itself is an accomplishment! As they slowly paddled back to the dock, surprisingly, I didn’t hear any chants of “sink, sink, sink!” Are the crowds getting nicer? It did bring back memories of when we participated many years ago. Same result, didn’t sink, didn’t win. 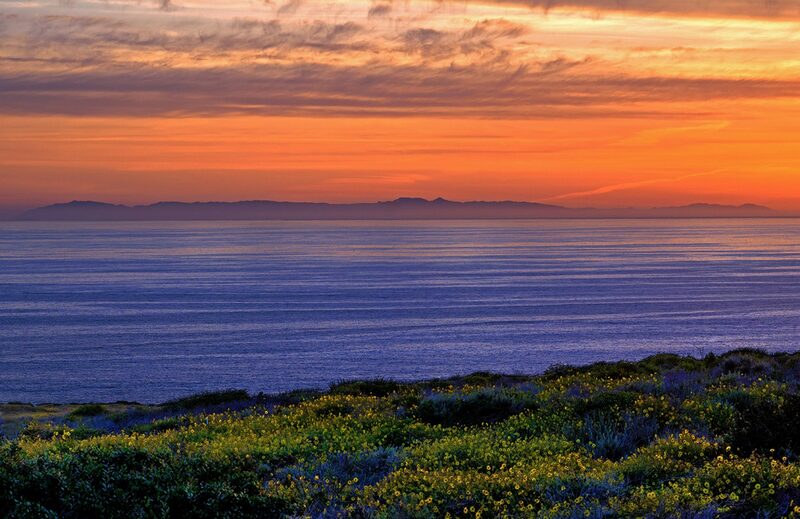 The bottom line, is it is a great experience, one of which I am glad I tried ONCE. Hammering and sawing on a hot September day isn’t my cup of tea, sitting in a chair taking pictures sounded perfect, and it was. 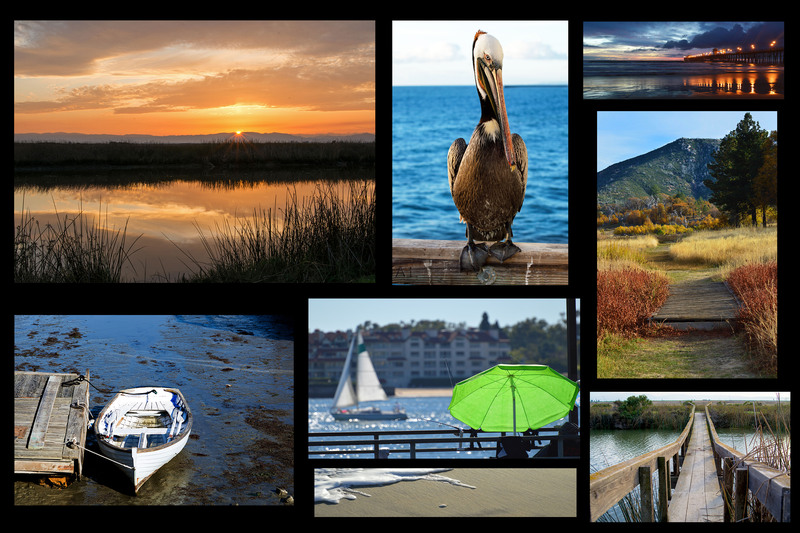 The Nail and Sail is part of the Oceanside Harbor days and is a crowd favorite. Sorry you missed it this year, but whether you participate or just come to watch, check it out in 2017.
Who knows, maybe crazy JoJo will give it a try a third time. 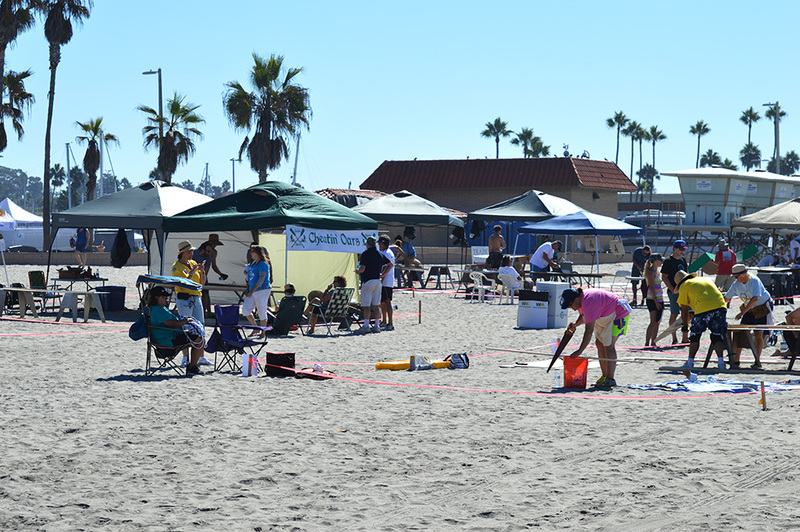 Previous PostPrevious Oceanside Harbor Days and the Nail and Sail Competition.